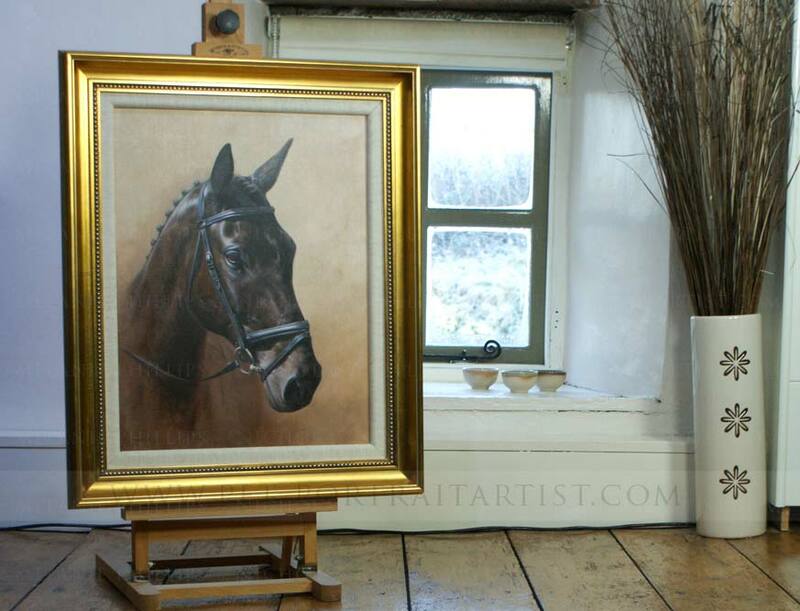 Harry is a Horse Portrait in Oil commissioned by Maya Knowland. The portrait was to be a graduation gift for Katrine Knowland and her sister was organising the portrait on behalf of her family in 2012. Nick painted Harry on Italian linen canvas at 18 x 14 size. You can see the photo Nicholas worked form on the left, it was quite a dark photo and they wanted to depict Harry’s true colouring in the portrait so we had other photos of Harry to work with too. Katarine was overjoyed when she received the painting on her graduation and emailed us a lovely photo when the portrait was displayed in her home. We love her wallpaper, and hope you enjoy viewing the photos too. 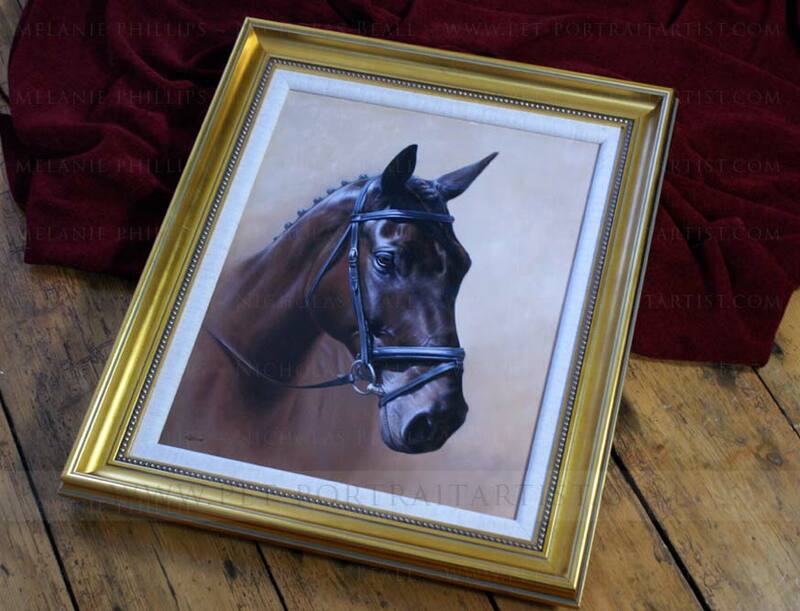 If you would like a portrait of your horse, perhaps for a graduation gift, why not drop us a line with your photos. We would love to work with you. Harry arrived! I just wanted to say thank you so much, you guys have been amazing the whole way through and so helpful with everything, the changes, framing, and constant contact we really felt part of the making of this gorgeous portrait. No one could have done a better job, Nicholas has totally captured the essence of Harry it's absolutely incredible, better even than a photo of him he has so much presence in the painting. Katrine was over the moon with it and has said countless times that it's the best present she's ever had. So a huge thank you!! I look forward to my graduation where I'll hopefully be getting one done of my horses too! Fingers crossed, I'll have to hint at my parents! Hope you guys have a lovely Christmas and New Year! 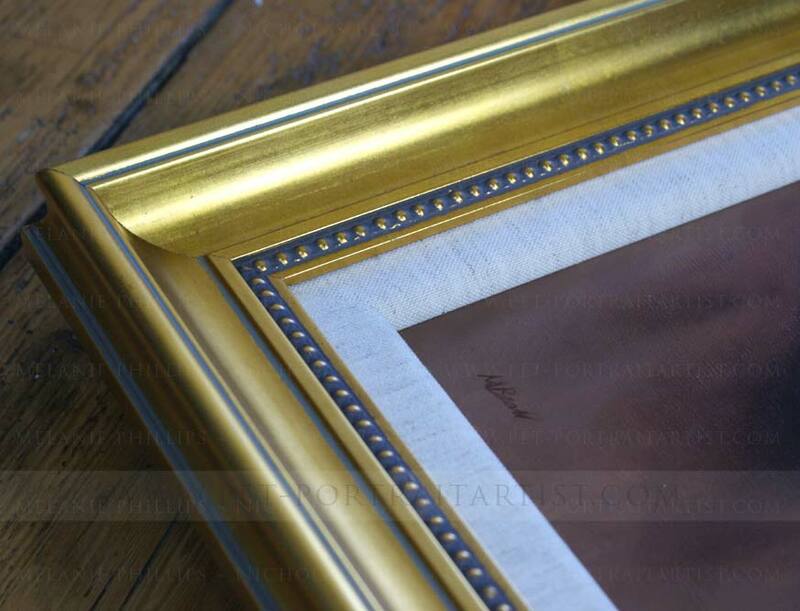 The portrait of Harry was framed by our local framer with a beautiful gold frame and inner slip. We have access to many of different types of frames and are always able to find something to suit your taste and home decor. Just drop us a line at any time with your ideas. We were absolutely thrilled to receive this lovely photo of the oil painting of Harry displayed on the wall in our clients home. We love the wallpaper too! 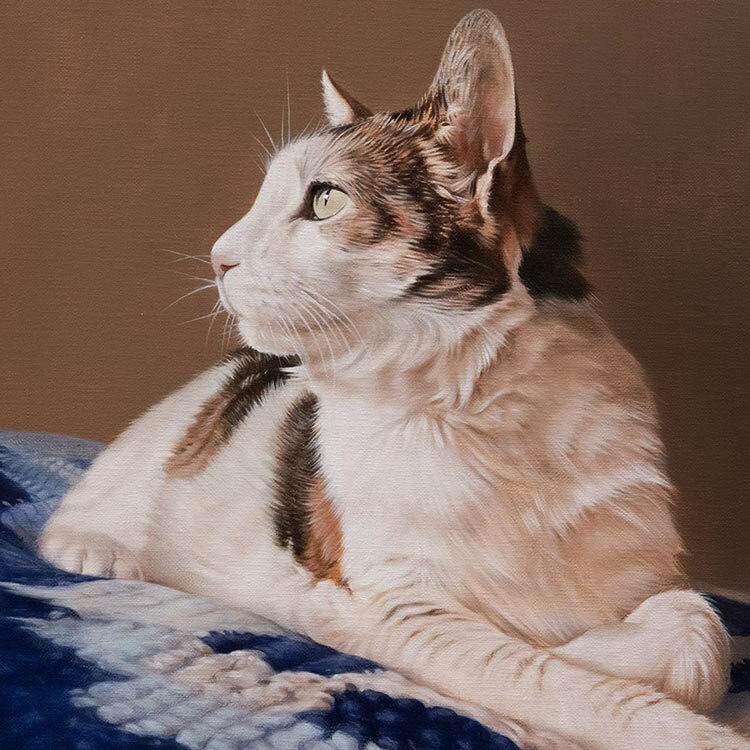 We are so pleased that Maya loves the painting, we are always delighted to hear from all of our clients once they have received their portraits, especially when they send photos. 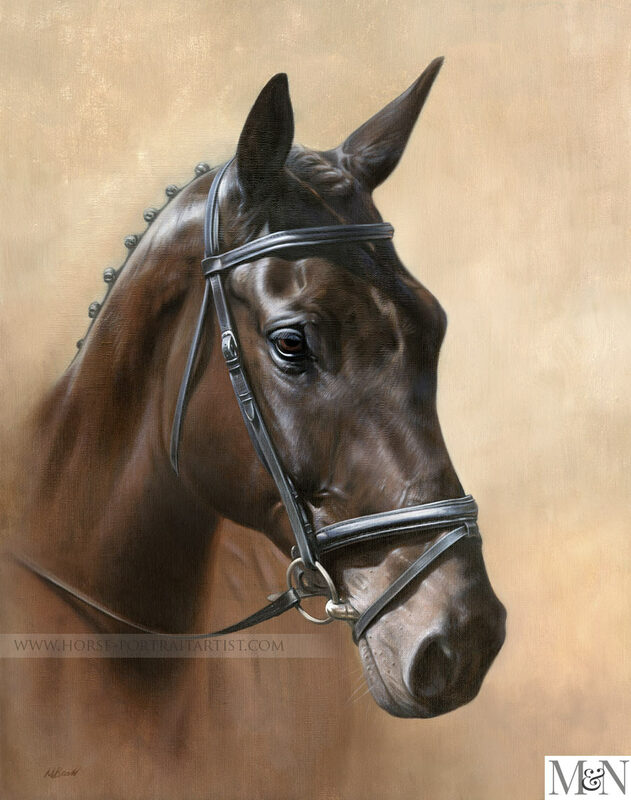 We hope that you enjoyed reading about Harry's horse portrait in oils along with reading about the commission too. 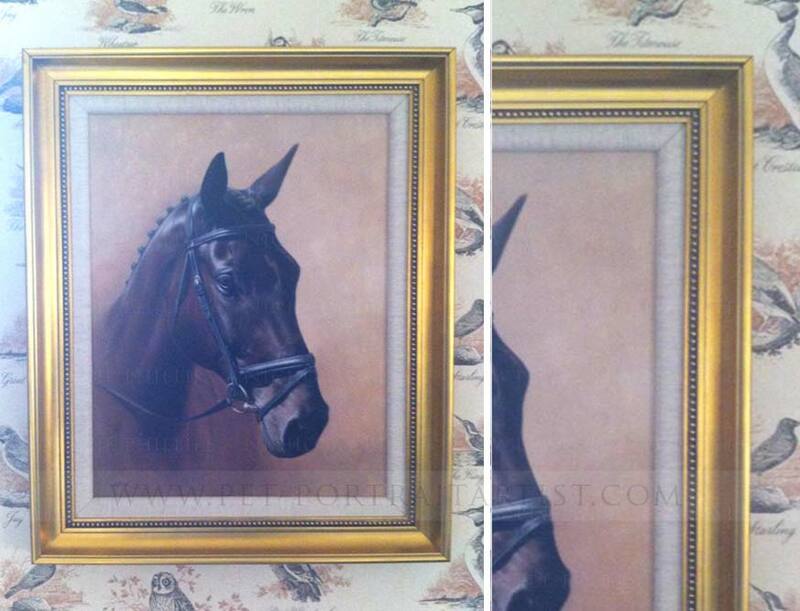 If you have a horse similar to Harry that you would like Nicholas to paint, we would love to hear from you. 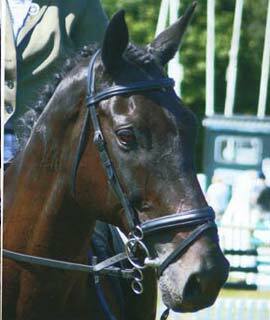 Email us by visiting our Horse portraits contact page.